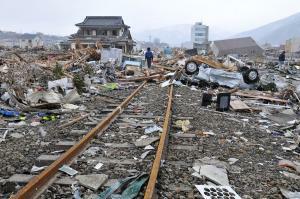 TOKYO, March 25 (UPI) -- The death toll from Japan's March 11 earthquake and tsunami crossed the 10,000 mark Friday, with police putting the number of confirmed deaths at 10,019. The National Police Agency also announced that 17,541 people remained unaccounted for, Kyodo News reported. The report said about 250,000 people remained at about 1,900 evacuation centers in the disaster-hit northeast region. In Miyagi Prefecture, police sought help in identifying more than 2,000 bodies by posting such information as clothing and body type, the report said. A once-trendy hotel in Tokyo scheduled for demolition will serve as a shelter for evacuees from the recent disasters, officials said. The Grand Prince Akasaka Hotel, a 40-story, 700-room showcase of the 1980s, will remain open through June to house as many as 1,600 people made homeless by the earthquake, tsunami and radiation leaks from the earthquake-crippled Fukushima Daiichi nuclear plant, CNN reported.